Despite the best efforts of organizations of all sizes to adapt to the global proliferation of IT megatrends such as cloud, mobility, big data, and security, this massive wave of technology is inundating organizations, which are responding to these costly and complex challenges without the extensive IT resources available to large corporations. Businesses are fraught with very similar challenges and business initiatives, but are often boxed in with fixed budgets, less IT resources than their enterprise IT associates, and gaps in technical experience and expertise. 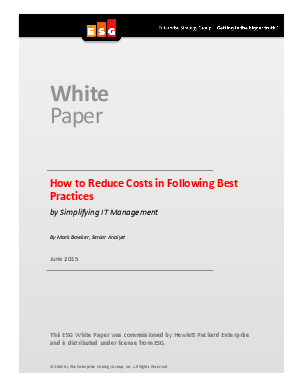 While this is not a new reality for these organizations, solutions that close the gap and arm SMB organizations with the technology and tools to simplify IT operations while also reducing costs are very achievable. This document will explore the challenges IT faces today, how industry peers are addressing these challenges, best practices for these issues, and how IT professionals may be able to leverage Hewlett Packard Enterprise to achieve their goals.